Habtoor Leighton Group (HLG), operating as Leighton Middle East Contracting, has been awarded a healthcare project worth SR1.18 billion ($316 million) by the Ministry of Health King Fahad Medical City. The project, referred to as PPNNCC, involves the construction of new medical centers on the current King Fahad Medical City campus to integrate with existing medical facilities. Located in the center of Riyadh, the PPNNCC will be delivered in joint venture with Al Latifia Trading and Contracting. Habtoor Leighton CEO and managing director Laurie Voyer said the new project further reinforced the success of HLG’s strategy to expand into new geographic markets. “This project is in line with our growth strategy to diversify our geographic footprint, and we look forward to working with our JV partner, Al Latifia Trading and Contracting, to successfully deliver this prestigious development for our client,” Voyer said. He said it also underlined the importance of Saudi Arabia to the Group’s growth plans. “Saudi is our largest growth market, and this project underlines our ability to secure work there,” he stated. Habtoor Leighton's new managing director-elect, Jose Antonio Lopez-Monis, said the medical project, which will be the first of five specialist hospitals to be built in Saudi over the next five years, will see the delivery of hitech medical facilities. “We are privileged to be awarded a project of this scale and significance, and look forward to delivering it to the highest standards of international quality," remarked Lopez-Monis. 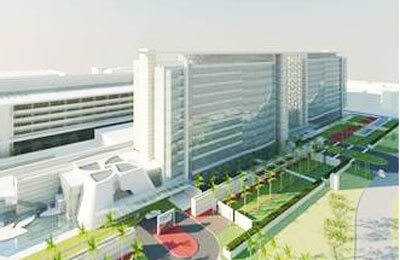 The group’s scope of works includes the construction of 11-storeyed National Neurosciences Institute and comprehensive cancer center, three-storeyed cardiac center, seven-storeyed laboratories and office building and two-level below ground car park. Additionally, the 234,000 sq m project proposes the construction of central services building spanning four levels, and a 320m high services tunnel, said Lopez-Monis. The project will also house a proton lab, which Habtoor Leighton is likely to deliver under a separate contract, he added. “We have developed a strong track-record in delivering state-of-the-art healthcare projects, with Mafraq Hospital and Arzanah Wellness & Diagnostic Center, both located in Abu Dhabi, leading examples of our specialist skills and technical expertise in this growing sector,” said the top official. This will be the first development activity this site has seen since the 1990s and in addition to 510 additional hospital beds, it will provide oncology, cardiology and other much-needed specialist services to the community.